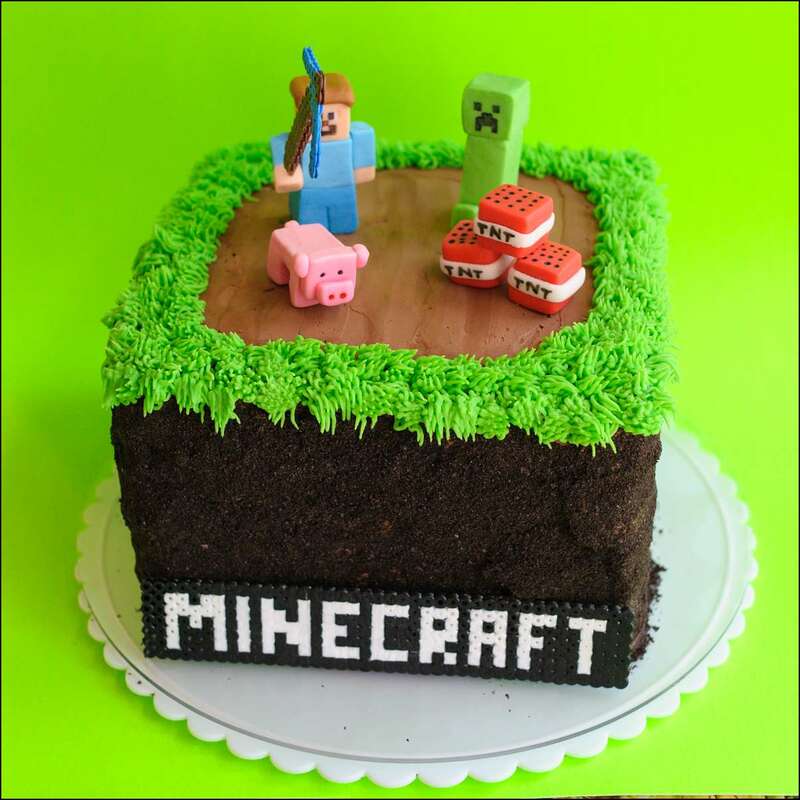 Do you sell the minecraft figures for the cake? Sure do. 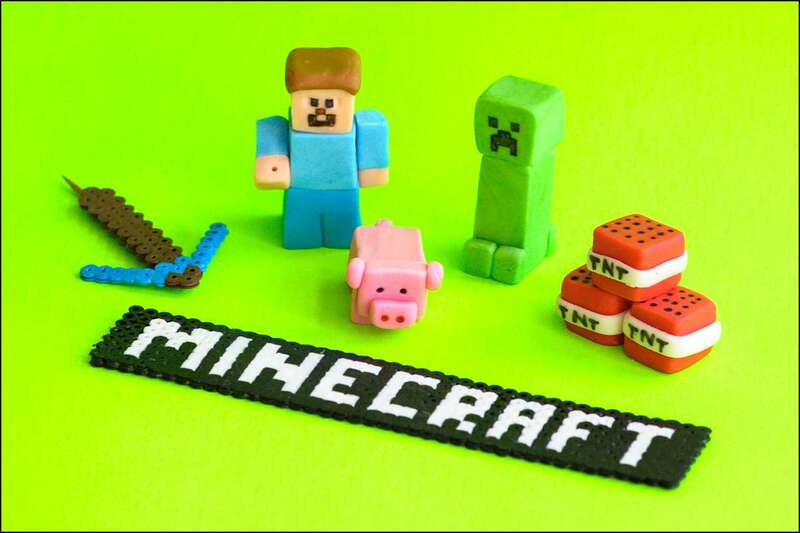 The cost is $45 plus shipping for the set of 6 handmade fondant figures (Steve, Creeper, Piggy and 3 TNT). I need 2 weeks to make them and let them dry a bit before shipping. Let me know if you’d like a set! How did you cover the cake with Oreos? Ice and then add, or add them to the icing and then put it on the cake? I definitely want to try making this! How did you treat the Oreos? Did you add them to the icing before putting it on the cake, or did you just pack them on after it was already iced? I so want to try this! Hi Katie….First I frosted the cake in chocolate buttercream, then pressed crushed cookies into the icing before it had a chance to crust over. Really easy, but kind of messy. Good luck! Thx for checking out my site! Could I buy a set. My daughter’s birthday is coming up. Hi Wendy, I can’t ship the cake, but you can order the fondant cake topper set. The price is $52 for 6 figures (Steve, creeper, pig, and 3 TNT blocks). Shipping and handling will be around $10 for 2-day shipping. The cupcake toppers are $20 per dozen (yes, only the creeper and TNT). Let me know if you’re interested and I’ll see if I can fit you into my schedule for June 19th. It does take 2 weeks to get them made and dry enough to ship. Thank you! Thanks so much for the great idea!! I just finished the cake for my sons bday. I don’t know how to post the pic though. Great, so glad it worked for you!! Thank you thank you thank you!!!! I had a last minute request for a Minecraft cake. I have made a couple but there was no way I had time to make to do the fondant pixels and figures. This design was perfect!!! The customer bought her own toys to put on top. You are a life saver!! !